If you just want to find out how to get married in California, this is the short and easy guide to tying the knot. It includes how to get a California marriage license, what you need to take with you to get it and places what you need to know about the ceremony. You can get a marriage license to any County Clerk's office, where you will have to appear in person. You can apply online in some counties, but that won't save you a trip to the clerk's office. Even if you complete the application online, you may still have to go to the office to pick up your license. It will save you time when you get there, though. Just do an online search for the county name and with the words "marriage license" or "county clerk." County Clerk's offices are open weekdays only. They often close at lunch time and are least busy in the middle of the week. Some locations take appointments, and others stop taking applications up to half an hour before closing time. You do not need to be a resident of California or the United States to get a California Marriage License. 18 is the minimum age to marry with no restrictions. A marriage license is immediately valid only in the State of California and remains valid for 90 days. Keep this in mind if you plan to get married at Lake Tahoe, where you might end up in the state of Nevada instead. Use this guide to find out more about getting married at Lake Tahoe. Confidential marriage licenses are available if you have lived together as a married couple. This kind of license is available only in the state of California and comes with some stringent requirements. This article may help you decide whether it's right for you. Proxy marriages are allowed in California, but only for members of the armed forces stationed overseas or in war zones. Contact the County Clerk for detailed requirements, which include documents witnessed by at least two military officers or by a notary. After the wedding ceremony, you still aren't official. You also have to return the marriage license to the County Clerk who will record it and can issue official copies. Both partners must appear together when filing the marriage license application. To avoid standing in line, check with the County Clerk ahead of time to see if they recommend making an appointment. Government-issued photo ID: A driver's license or passport is required for proof of identity. Other forms of ID may also be acceptable if you also take a certified copy of your birth certificate. Your parents' information: You will need to provide the full birth name of both parents and the state or country where they were born. Your Married Names: Both parties can choose the name they will use after marriage. Discuss this before you go to avoid delays (or worse, fights). You can't change your first name, but you can choose to keep your last name or use your spouse's last name. You can create a hyphenated last name like Smith-Shah or change your middle name to something create something similar such as Lady Shah Smith and Lord Smith Shah. Payment: The license fee varies by county, and you can look it up on the County Clerk's website. You can pay in cash, by pre-printed check with a California address, or a money order written out to the County Clerk. Some locations accept credit and debit cards with an extra fee but check in advance before you count on this option. Blood tests are not required to get a California marriage license. If you are divorced, you will need to know the exact date your divorce was finalized. If it was within the last 90 days, take your divorce decree with you. If your divorce is still not finalized, you will have to wait until it is. If you previously registered as a Domestic Partner and are marrying the same person, California domestic partnership statutes permit an individual to be both married and in a registered domestic partnership, so long as it is to the same person. If you are in a Domestic Partnership with someone else, you may need to consult an attorney to dissolve that legal relationship first. Under age consent: People younger than 18 need written consent of at least one parent (or legal guardian) and permission from a California superior court judge. You can be married by a judge, priest, minister or rabbi of any religious denomination who is 18 years old or over. Active and retired judges can also perform the ceremony. You probably know about people getting ordained online which allows them to perform marriage ceremonies. California also offers an option to get a family member deputized for a day, but it's a complicated and expensive process. You need one witness to sign the marriage certificate. 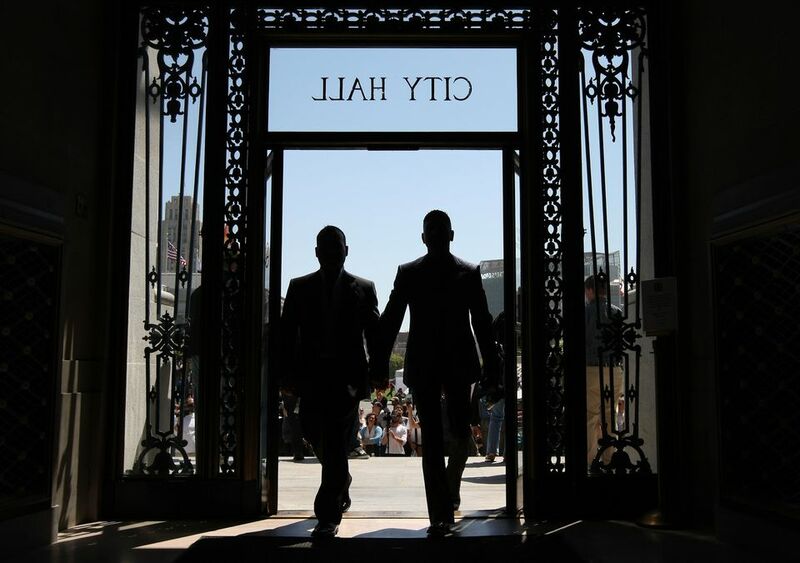 Larger cities perform civil marriage ceremonies by appointment at City Hall. There is an extra fee for holding the ceremony there, but some of the locations are beautiful, especially the San Francisco City Hall. In Los Angeles County, you can apply for a marriage license online, but you have to pick up your license in person. You can get information about fees, civil ceremonies and other information at the County Clerk website. In San Diego County, appointments are required, even if you just want to get a license. You'll find details at the County Clerk website, where you can also find the current license fee and locations for civil ceremonies. If you print and fill out the application form you find on the website, you can save time when you get there. In San Francisco County, you can print forms in advance at the County Clerk website. You can also make an appointment through their website up to 90 days ahead of time. Civil Ceremonies are performed at City Hall, weekdays only. Lake Tahoe is complicated. Part of the lake is in California and part in Nevada, and the laws are different. Some chapels in California issue marriage licenses on premises, but in Nevada, you have to go to the courthouse. More about getting married at Lake Tahoe. Big Sur views are enough to get anyone in a romantic mood. Lodgings range from cozy cottages to world-class hideaways. Carmel and its storybook architecture may inspire your own romantic story. You can take a walk on the beach, stroll through town holding hands, and cuddle over a drink at sunset. Catalina Island has a cute, walkable downtown, beautiful ocean views, and just enough to do without wearing you out. Its cozy bed and breakfasts and the fabulous Inn on Mt Ada make the perfect places for a romantic getaway. La Jolla is one of the most beautiful coastal settings in Southern California, with excellent restaurants and a romantic cliffside walking path for sunset strolls and smooches. Laguna Beach is one of the best places to stay in a hotel right on the beach, watch the sunset, and fall asleep counting wave crashes instead of sheep. Mendocino is the place for wild scenery, charming accommodations and lots of time (and places) to gaze into each others' eyes in front of a roaring fireplace. Napa Valley has the obvious wine and food-related activities, with world-class dining and lodging. Ojai is the native American word for "nest." It's a place where you can cuddle your sweetheart in this cute little town in the Santa Ynez Mountains. Pebble Beach offers California's best coastal scenery... beachcombing... and a bagpiper at sunset. San Francisco They don't call it the "cool, grey, city of love" for no reason. Santa Barbara is a place where movie stars have been planning romantic trysts (on and off screen) for almost a century, and it's easy to understand why. Santa Ynez Valley is a hidden gem just north of Santa Barbara, where you can stay in tiny Los Olivos, go wine tasting in town, take a little stroll and go to bed early. Sebastopol and Occidental have it all for a romantic interlude: a sensational spa nearby and two cute little downtowns tailor-made for strolling hand-in-hand.